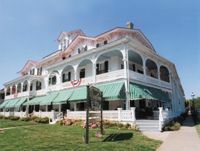 The Chalfonte is the oldest continually operating hotel in Victorian Cape May; built in 1876 by Civil War Hero Colonel Henry Sawyer. Known for its family and child-friendly culture, its home-style southern cooking, sweeping verandahs and rocking chairs, the hotel is a traditional seasonal resort, with 70 rooms (10 with private baths), original antiques, ceiling fans, louvered doors. Rooms do not have air-conditioning, televisions or telephones, a perfect atmosphere for a rested vacation. The hotel features The Magnolia Room Restaurant, Children's Dining Room, King Edward Bar and hosts weddings, family reunions, retreats, with season-long programming including Elderhostel, classical, folk and blues music series, children's festival, opera, theater and art exhibits. Rates from $130-300 per night (depending upon room type) which includes breakfast/dinner. EP plan available. Visa, Mastercard, Amex accepted during season: Memorial Day to Columbus Day. Call Hotel directly or e-mail mailing address for brochure/rate information. This and other Cape May Bed and Breakfast Inns can be found here in The Register.